Athletes representing Korea at the upcoming Asian Games 2018 Jakarta-Palembang pose for a group photo during the team’s launch ceremony at the Olympic Handball Gymnasium in Seoul on Aug. 7. Team Korea, competing in the Asian Games 2018 to be held in Jakarta and Palembang, has pledged to bring home at least 65 gold medals. This would secure the overall No. 2 spot for Team Korea in the medals rankings for the sixth time in a row. On Aug. 7, a launch ceremony for Team Korea was held at the Olympic Handball Gymnasium at Seoul’s Olympic Park. 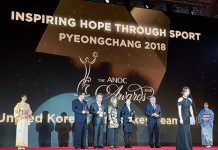 Prime Minister Lee Nak-yon, Korean Sport & Olympic Committee President Lee Kee-Heung, Team Korea’ chef de mission Kim Sung-jo, and some 600 athletes attended the event. “Achieving the best results is important, but watching you persevere and perform at your very best can be a huge motivation for both the players and the people watching at home. This is the kind of moving story I hope you will tell at this year’s Asian Games,” said Prime Minister Lee. “The joint march of North and South Korean athletes during the Opening and Closing ceremonies, and the participation of inter-Korean teams, will be a great experience for all the athletes involved. I hope that our team will get along and cooperate with athletes from North Korea. You should know that each of you have the ability to set the stage for reconciliation and peace,” he said. At this year’s Asian Games, some 807 athletes from Korea will complete in 39 events. In total, Team Korea will send 1,044 participants to Indonesia. Following the inter-Korean women’s ice hockey team formed during the PyeongChang 2018 Olympic Winter Games, the two Koreas will compete with joint inter-Korean teams in women’s basketball, canoeing and rowing in the upcoming Games. The Asian Games 2018 Jakarta-Palembang will take place from Aug. 18 to Sept. 2. More than 11,300 athletes from 45 countries will compete in 40 different events, with their eyes set on 465 gold medals. Prime Minister Lee Nak-yon (third from right) salutes the national flag during the launch ceremony for athletes representing Korea at the upcoming Asian Games 2018 Jakarta-Palembang, at the Olympic Handball Gymnasium in Seoul on Aug. 7.